Provitamil Oat Drink has a great taste. It is a real alternative to milk products – it’s great in hot drinks and cooking, not to mention delicious to drink on its own. 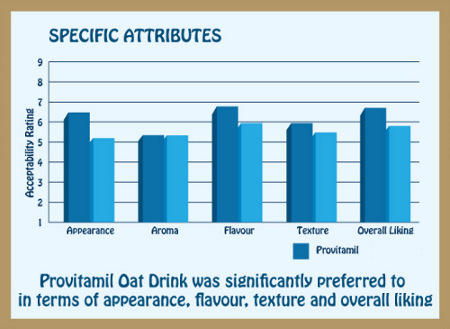 SHUIn March 2013, the Centre for Food Innovation at Shefield Hallam University was commissioned to conduct an independent blind taste comparison between Provitamil and the brand leading oat drink. The panel was made up of 24 untrained consumers across a wide demographic range who are familiar with this category of product. Some of the panellists are regular consumers of the brand leader. … when asked which brand they would buy on shelf, 79% said they would pick up Provitamil, regardless of the price. 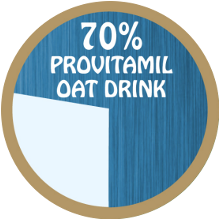 … knowing that Provitamil is 10% cheaper than the brand leader, 83% of consumers said they would pick up Provitamil Oat Drink. Why not take the taste challenge for yourself? You can buy Provitamil Oat Drink from most good supermarkets and from a wide variety of stores - click here to find out more. OR you can buy Oat Drink right now by clicking here.